The Jordan Brand is looking to boost it sales before the year ends, while giving satisfaction to their ever-loyal followers after announcing the release of the Jordan Brand Holiday 2010 Collection this December. One of the most anticipated shoes from the Jordan Brand Holiday 2010 Collection is the Air Jordan Formula that will come out in Black/Varsity Red-Cement Grey colourway at a very reasonable price in the market. 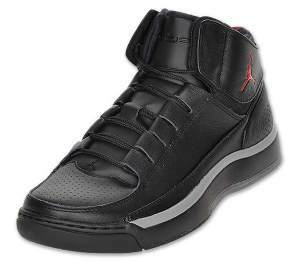 Featuring a black leather upper part accented by gray and varsity red colors, the Air Jordan Formula is expected to hit strides this Holiday Season, because besides its elegant appearance, the shoes is also excellent for playing because of its durability and comfortable feel while wearing it. Once it hits the shelves this Holiday Season, grab one immediately and you’ll definitely get your money’s worth.